Mahaffey offers a wide range of Rapid Deployment Shelters (RDS). Since 1924, we have provides RDS and complete base camps for the U.S. Army, numerous National Guard exercises, U.S. Navy, and the Department of Defense, just to name a few. They take up little space, making them easy to transport. We can deploy our turnkey base camps in as little as two hours. 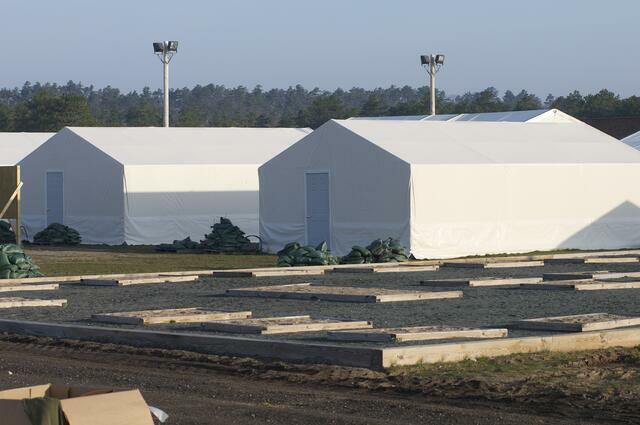 Once erected, the shelters can be expanded to form larger facilities, and can be outfitted with flooring, lighting, doors, power distribution, and more. The shelters can be climate-controlled to meet any temperature needs. At Mahaffey, we are continuously working to improve our RDS facilities to meet rapidly changing military requirements. Call us today to find out how we can provide the best possible solution to your next military exercise.